Mirror decorations are often used to add depth and dimension to small spaces in the home. During the holidays, mirrors are perfect for adding a creative decorative touch in entryways, bedrooms and other confined areas in the home. Decorate large mirrors in your entryway with small twinkle lights around the frame. Add swags of spruce, holly or even a few decorative snowflake lights to the mirror for a complete holiday look that really shines. For a decorative touch that house guests appreciate, hang wreaths from framed, vertical mirrors and above dresser vanities to bring the holiday spirit into each bedroom. Keep it simple, and choose a plain or lightly decorated wreath to make sure that the decoration is just enough rather than too much. Spread well wishes easily and quickly with message garland. This works especially well if you have a long mirror that is horizontal. Message garland is inexpensive, is available at most party supply stores and can be layered with other types of garland. For an elegant approach, hang glass or silver decorations from varying lengths of silver thread; tape each thread to the back of the mirror. The project will take less than 15 minutes, and the look will last into the New Year. Tie ribbon around your mirrors, as if they were presents going under the tree. Create a holidays-only mirror by painting a frosted border, a scattering of candy canes or a few well-positioned pine trees. Look for paints meant specifically for glass to make sure that your work of art doesn’t wipe away the first time someone touches it. Decorating with mirrors doesn’t have to stop on the walls. 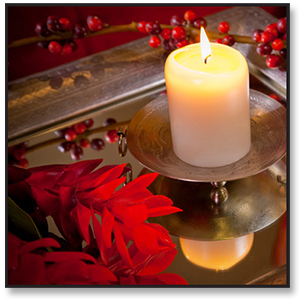 Place mirror tiles under candles or floral arrangements to add depth to your centerpiece. Create ornaments out of small mirrors with a hot-glue gun and a little ribbon. Choose a variety of shapes and sizes; just make sure that they are not too heavy for the branches of your tree. Put a dot of glue on the back of the mirror, near the top, and affix both ends of a 3- or 4-inch piece of ribbon to the mirror with the glue. Allow time to dry, and then hang these simple and chic ornaments on the tree.